You are currently browsing the Western Custom blog archives for March, 2009. Nobody likes stumbling around in the dark looking for a light switch, but let’s face it, when your eyes aren’t adjusted to the light, turning on the lights can be just as painful. A great solution to this dilemma, whether in the bathroom or the kitchen, is under counter lights. With proper installation, these lights can be left on all the time and provide a dim light source that will help you avoid stumbles and falls but won’t blind you either. Under counter lights are also quite popular in modern design; most contemporary kitchens come with them installed beneath the counters or more commonly, the cabinets. Most under counter lights are easy to install as well, though the electrical can be a bit trickier. But even if you need to hire an electrician, the fixtures and the wiring can be installed in no more than an hour. If you’re a bit of a handyman, you can do it yourself too! There’s nothing quite like taking a relaxing bubble bath in an old fashioned bathtub. 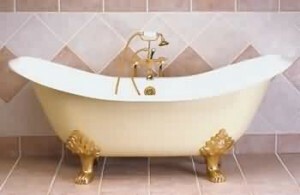 I think of all the old fashioned bathtub designs, clawfoot bathtubs are my favorite. When I was little I can remember taking a bath in the clawfoot bathtub at my grandma’s house, and I was always fascinated with the idea of a bathtub that had feet. In fact, my grandma used to tease me that while I was sleeping, the bathtub would get up and walk around the house! I even remember waking up during the middle of the night, running to the bathroom, and making sure the bathtub was still there! When I had my own house I knew I wanted a clawfoot bathtub of my own. It took me a while to track down a vintage bathtub that would fit well in my bathroom, but when I did, I ordered it right away. Now I can enjoy a good soak just like I used to when I was a little girl!